Children in Crisis is delighted to announce the inauguration of the Bibangwa School, generously funded through a partnership between the charity The Virdee Foundation. 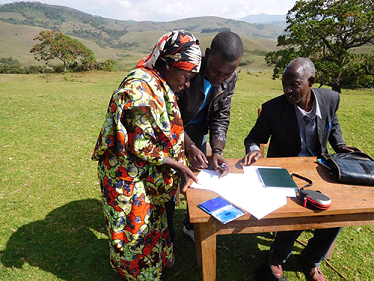 Two hours’ walk from the nearest road, the new school is set on the High Plateau in South Kivu, the Democratic Republic of Congo, the school formally opened on 19 August and already filled with 165 children. Originally completed in April, formally inaugurating the L-shaped school with its six classrooms had to be postponed because rebel groups moving across the Plateau made it too dangerous for visitors to travel for inaugural celebrations. Communities living in this area have suffered decades of neglect by the government as well as a conflict involving many rebel groups. The existing dark and over-crowded school had been built using sticks and mud. Its teachers were untrained and unqualified. As a result of this, Bibangwa’s children are at the extremes of isolation, where they are receiving no help or investment from the government or other organisations. The former wattle and daub school, built by a resourceful community who are desperate for their children to learn, was unfortunately ruined by the Plateau’s torrential rains. Thanks to the Virdee Foundation’s support, they have been able to work with Bibangwa’s parents to construct the new, durable, six-classroom school for their children. The new school has been named after The Virdee Foundation and is known as “The Virdee School”. It is a community-owned and community-run school that has been established in a safe and dry place for future generations of the children of Bibangawa to attend, whom now have the opportunity to learn and enhance their growth, knowledge and development in both education and life. A leaking roof is unable to protect the children nor the classroom posters from the rainfall. 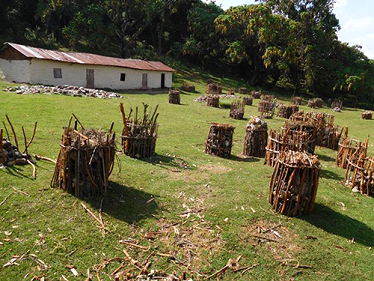 Bibangwa’s previous school was built through a significant effort from the community, using local traditional techniques. It was a bamboo frame construction with white clay walls. Though these techniques can work quite well for domestic dwellings, they did not work well at all for classrooms, providing an unstable and unsettling place for children to learn. The fundamental absence of large, frequently-tended fireplaces in schools, meant that the walls were crumbling and the foundation was deteriorating, as there was no heat or smoke to dry and preserve the clay which is a critical element required to sustain the main structure. Due to this, the Plateau’s heavy rainfalls quickly degraded the corrugated tin roof making the classroom structure an unsafe and unfit habitat for children to learn. As a result of this, the foundations of the classrooms were cold, muddy and often wet – especially when the Plateau’s heavy rainfalls come during wet seasons restricting children to attend class sessions and learn. The untreated and thin corrugated metal roofing sheets rusted through the classroom’s structure much long ago. Space was also an issue – there simply wasn’t enough room for the school’s 165 students in its four small classrooms. 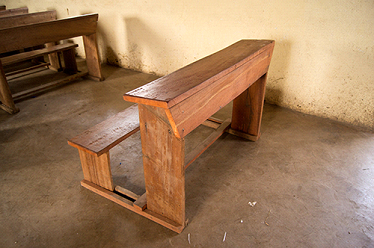 Though unstable, the bamboo benches gave some students a place to sit within a minimal capacity, however the real difficulty and challenge they were facing was having no desks to support their books when they were writing, and were therefore having to balance their books and write on their laps. An absence of desks forces children to write in books perched on their laps. The rocks were used as benches when the classroom became too full. Our report on the condition of Bibangwa’s school, and the conditions in which children are trying to learn, left The Virdee Foundation in no doubt – that their support will bring lasting improvements to the mental and physical wellbeing of Bibangwa’s children. 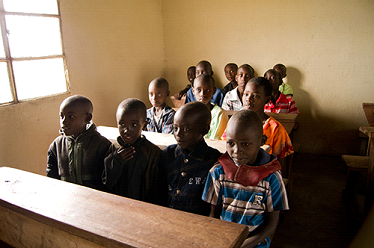 Bibangwa School has 165 children, between 7 and 14 years of age. 85 of these are girls and 80 are boys. They are taught in Swahili, learning to read and write, numeracy, science and French. But their education goes well beyond this. 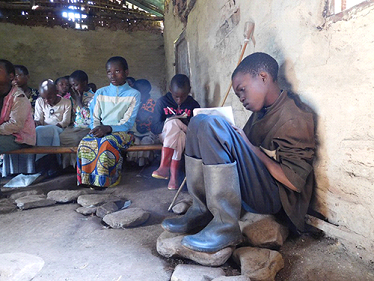 The involvement of Batwa families in building the school meant that many of their children are enrolled in school for the first time; mixing with children from other tribes and establishing an understanding of one another from an early age. Understanding and respect that will play a vital part in promoting inter-ethnic peace in the future. The construction of the new Bibangwa school has been built with durable materials – solid brick walls with deep foundations, galvanized (rust resistant) metal roofing sheets, and cement floors. It has been designed to last and to protect children from the cold weather and the heavy rainfall. The new desks and benches in the school’s six classrooms now provide every child a place to comfortably sit and learn in a stable and fit capacity. They’ll no longer have to stoop over books and write in books perched on their laps, and the windows allow natural light to illuminate the classrooms for children to be able to learn without having the unpleasant distraction of an uncomfortable and unfit environment, with damp and dark surroundings. Benches and desks, made by local carpenters, allow the children to sit and write in comfort and stability. Partnership has been the driving force behind the construction of Bibangwa’s new school – between Children in Crisis, The Virdee Foundation, EMI (our local Congolese partners), and the parents of Bibangwa. Children in Crisis has been working with their local partner, Ebenezer Ministry International (EMI) , to educate and protect children on the Plateau for the past ten years. By building new schools and training teachers, Children in Crisis aims to reach every child and create the opportunity for them to break out of the cycle of poverty, isolation and conflict. The contributions made by the Bibangwa community have been critically important for the successful establishment of The Virdee School. Bibangwa is one of the most remote places in which we have undertaken school construction, therefore we wouldn’t have been able achieve our mission if it wasn’t for the significant help provided by the local community. Trucks have had to offload building materials at the end of one of the few dirt roads which serve the area. One of the many contributions from the community have been to physically carry these materials, including heavy metal roofing materials, by hand or head on a 2-hour walk over hilly terrain to Bibangwa due to the lack of infrastructure and transport availability in the area. Koy Thomson, Chief Executive of Children in Crisis, said “On hearing of our mission to reach the forgotten and most disadvantaged children in remote and often conflict affected environments, Professor Peter Virdee showed no hesitation in reaching out to us to ask how a partnership with The Virdee Foundation might be able to help us improve the lives of more children. From the earliest days, the Virdee Foundation has shown a depth of critical understanding and engagement which has helped work through all obstacles and difficulties; such as when resurgent conflict delayed the school inauguration”. EMI, our Congolese partners, have worked closely with Bibangwa’s parents to help them successfully complete the construction work of the new school. 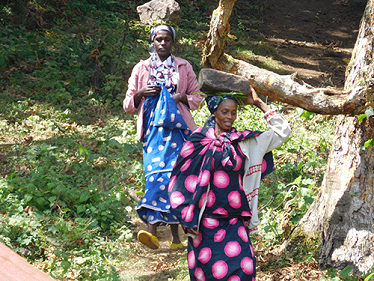 The following images show the community members carrying stones, which were being gathered for the school’s foundations. The first image below show structures of bamboo cages that were laid out, where each cage represented the foundation stones that were collected by one family – as a result, you can see there were plenty of families involved where women were doing very much of the heavy work. Foundations stones were being gathered by the local community members. Each bamboo basket individually represented a different family’s contribution illustrating the number of families involved in this tremendous project. The contract, in which EMI, Children in Crisis and Bibangwa community agreed to our responsibilities in the successful development and construction of the new school which was also signed off. As shown below, the Head of the Women’s Committee, who was helping with the construction of the new school, signed her signature on the school construction contract. The Head of the Women’s Committee signs the school construction contract. Koy Thomson, Chief Executive of Children in Crisis stated “I very much hope that our partnership with The Virdee Foundation will go from strength to strength. Good partnerships are founded on shared values, celebrating what we achieve while also enduring through challenges. These are qualities that have been amply demonstrated in this new school, our first step together”. 7 days a week, 365 days a year, The Midland Langar Seva Society (MLSS) organise a ‘Soup Kitchen’ which consists of a variety of hot food and beverages that is distributed to the less fortunate, which therefore embodies the charitable side of the Sikh Religion. The charity is based on the teachings of Guru Nanak Dev Ji, who initiated the concept of “langar” over 500 years ago. Langar means ‘free kitchen’ for all, irrespective of gender, class, religion or social status. The main idea behind the concept of langar is community dining, equality amongst people and the manifestation of unity and sharing. Thus, what MLSS have managed to achieve, is taking the langar out of the local Gurdwara and rolling it out onto the streets for those who are in need of it the most. MLSS take no monetary donations for the food they serve, and all the food is donated by the local congregation and general public. On Monday, 11th of September, The Midland Langar Seva Society – along with the help of The Virdee Foundation, and volunteers including, Ex-Premier League and England footballer, Emile Heskey – conducted a charitable offering of food and drinks to the homeless in the heart of Birmingham City Centre. Between the hours of 6-8pm, hundreds lined up not only awaiting their daily bread, but to witness one of their country’s greatest sportsmen distributing food and drinks to them which brightened up their lives and brought them in high spirits on a very gloomy Monday evening. Emile Heskey personally greeted the locals and took photos with them, which most definitely was a very special day for all involved. Professor Peter Virdee established The Virdee Foundation to better the needs of abused women and children, and is also involved in numerous forms of charitable giving; with his most recent projects being a children’s school that was built in Congo and the entire refurbishment of the local Gurdwara in Shephards Bush, London. MLSS was established about 4 years ago by 2 friends, Randhir & Pramjit, who wanted to help the homeless by doing some “Langar Seva” (selfless food service). They started in Walsall, just feeding 15 people and this number magnified rapidly over the course of the years, eventually spreading across the whole of the UK with the generous help of numerous volunteers. MLSS have not only surpassed the boundaries of providing food within the UK, they astoundingly provide food giving in 16 other different cities across the world; including India and the USA, which serves up to 11,000 meals per week – equating to an incredible total of 44,000 meals every month! MLSS have remarkably expanded their global footprint, operating with over 100 core volunteers enabling them to successfully achieve their global mission. Their principle street feed is in Birmingham which operates 7 days a week, 365 days a year and is continuously growing. Professor Peter Virdee, MLSS and the volunteers stand firmly behind the importance of charitable giving and strongly value the significance of it. The feed that took place yesterday was just the start of an alliance between MLSS and The Virdee Foundation, as both organisations anticipate in collaborating on other feeds in the near future. What makes the perfect partnership? And what role does this play in helping achieve greater social impact with your charitable giving overseas? of whom are members of ‘diaspora’ communities in the UK – donated £156 million worldwide to good causes in 2015, an increase of 33%. I was delighted to have the opportunity to explore this further at a recent breakfast event that CAF hosted in partnership with Spear’s Magazine, where we brought together a panel of experts in international giving to discuss how partnering with the right people or organisations can maximise the impact of philanthropy overseas. Professor Peter Virdee of The Virdee Foundation talked about the importance of their work with charity partners in the field to help transform lives around the world. In order to improve the lives of vulnerable women and children in India – one of their chosen causes – The Virdee Foundation works with local charities and follows a diligent verification procedure before selecting new organisations to partner with. Professor Virdee feels strongly that, before entering into a partnership with an NGO, it is imperative to know their aims and motivations inside out and discuss what would happen in the event that the partnership breaks down – just like what one might do in a marriage. By using this model to partner with local community organisations, The Virdee Foundation has supported hundreds of women and children in need across India in the most effective – and impactful – way. We also heard from Paul Kidner, General Manager of The People’s Trust, an organisation which aims to tackle unemployment in Greece through entrepreneurship. The People’s Trust works with a wide variety of partners from business coaching services and NGOs to banks and microfinance companies in order to offer young Greek entrepreneurs the opportunity, finance and resources required to thrive. This multi-faceted approach to partnering means that The People’s Trust is able to support aspiring entrepreneurs with start-up loans, grants, mentoring and coaching. In turn, these new businesses create employment for those in need and contribute to the recovery of the Greek economy. Paul describes this as a “multiplier effect” – when The People’s Trust supports one new business, it is also supporting the families of people employed there and this has a wider social impact on the Greek community and economy. It was fascinating and inspiring to hear Professor Virdee and Paul’s first-hand account of their challenges, experiences and the difference they have made. It gave me a clear insight into the amazing things that are being achieved on a global scale, and the role in which my myself and my team here at CAF can play in being a perfect partner to support high net worth donors. CAF operates in nine different countries across six countries, allowing us to harness local knowledge and expertise on the ground level so that we can support tax-effective giving on a global scale. Our donor advised fund, the CAF Charitable Trust, is an ideal giving vehicle for those seeking to create change around the world and our team of experts will support you at every step. We carefully verify any charities operating overseas to ensure that we minimise risks and to ascertain that your donation is going to where its impact will be the greatest. We have access to the International Diaspora Engagement Alliance which uses an online tool to connect global givers all over the world to enable you to learn from others working in this area of philanthropy. CAF has access to ‘giving circles’ where donors with a shared cultural identity can join together to pool their funds and achieve a greater social impact. If you would like to know more about how we can support your international philanthropy to change lives. Our donor advised fund, the CAF Charitable Trust, is an ideal giving vehicle for those seeking to create change around the world and our team of experts will support you at every step. We carefully verify any charities operating overseas to ensure that we minimise risks and to ascertain that your donation is going to where its impact will be the greatest. We have access to the International Diaspora Engagement Alliance which uses an online tool to connect global givers all over the world to enable you to learn from others working in this area of philanthropy. CAF has access to ‘giving circles’ where donors with a shared cultural identity can join together to pool their funds and achieve a greater social impact. If you would like to know more about how we can support your international philanthropy to change lives. We have access to the International Diaspora Engagement Alliance which uses an online tool to connect global givers all over the world to enable you to learn from others working in this area of philanthropy. CAF has access to ‘giving circles’ where donors with a shared cultural identity can join together to pool their funds and achieve a greater social impact. If you would like to know more about how we can support your international philanthropy to change lives. On this special episode of the Social Enterprise Podcast, Rupert Scofield, President of FINCA International joins philanthropist Professor Peter Virdee. An entrepreneur, Peter’s business interests span real estate, renewal energy, minerals trading, and insurance broking. Committed to helping some of the world’s poorest and most needy people, he has said it is his ambition to give away half of his wealth. Founder of The Virdee Foundation, he is also a patron of the NSPCC, is on the board of the English National Operator, and sat on the philanthropy advisory board of Coutts & Co. He talks about his motivations for giving, explains his approach to philanthropy, and reveals how he chooses between different causes. The Giver: Prof. Peter Virdee, a property magnate and chairman of the Virdee Foundation, which strives to help vulnerable women and children. Seeing my parents giving money, especially as we came from a very humble background as they had only been allowed to bring £3 with them from India, was inspirational. Growing up I couldn’t understand this — I thought we were suffering at the time, but they were still giving money out to people. That had an impact, as did my religion. The Sikh religion clearly states we should give at least 10 per cent of our wealth to charitable causes. Property is my core business. I’m involved in several other businesses such as renewable energy, spread betting, insurance brokerage, pharmaceuticals and the care industry. All these have something to do with real estate and we now manage over £5 billion worth of assets. This has allowed me to set up my philanthropic ventures and sequentially I have been invited to sit on the philanthropy advisory board of Coutts. I spend about 30 per cent of my time on charity and community work, often mentoring children and young adults. I look at the DNA of the charities I give to — what I don’t like to do is reinvent the wheel. The Virdee Foundation looks at the direct impact the charities have on individuals: there’s a test that we do and then I take that to the board. What drew me to Kids for Kids is the fact they’ve adopted 78 villages and had an impact on over 364,000 people in such a remote place. The work that Patricia has done to date is phenomenal and very touching. I was invited to the Ambassador’s Ball, which is where I met her, but prior to that — and Patricia doesn’t know this — Kids for Kids was on my radar, so when I got the invitation I said I’m definitely going to get involved. You’ve got to have political willpower in any country — hand in hand with the charity, you need to make sure you’ve got political clout and try and get that directly or indirectly into the region. I’m a very firm believer in lobbying governments to actually make a difference in regions such as Darfur. It’s a shame governments sometimes turn a blind eye. If we don’t keep bringing it to their attention, these issues will drift away to the back of their minds. Kids for Kids is something we will add value to. I will definitely be taking my expertise and my black book and seeing how I can help in that region, because you have to have a two-pronged approach on this — you can’t just go down the charity route, you have to go down the political route as well. Philanthropy is part of a journey. This is a conduit between now and the good times — you can’t have people who rely on charity all their lives, you have to make these people self-sufficient, they have to generate their own income and a better life for themselves. A good charity should always make sure it allows the people it’s supporting to better themselves by doing and getting into that position if they can. We are delighted to announce a new partnership with the philanthropist, Professor Prof. Peter Virdee, whose charitable foundation is funding the construction of a new school in Bibangwa, DR Congo. Located a three hours’ walk from the nearest road, on the High Plateau of eastern DR Congo, Bibangwa’s children are at the extremes of isolation. They’re receiving no help or investment from the government or other organisations. The current wattle and daub school, built by a resourceful community who are desperate for their children to learn, has unfortunately been ruined by the Plateau’s torrential rains. Thanks to the Virdee Foundation’s support, we will be able to work with Bibangwa’s parents to construct a new, durable, six-classroom school for their children. The Virdee school will be community-owned and community-run. It will be a safe and dry place in which future generations of children can grasp their chance to learn. A leaking roof is unable to protect the children or classroom posters from the rain. 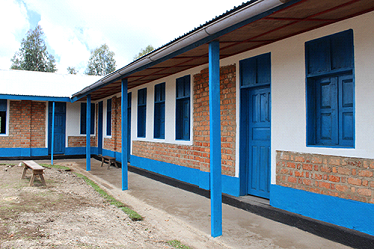 Bibangwa’s current school was built through significant effort from the community, using local traditional techniques. It’s a bamboo frame construction with white clay walls. Though these techniques can work quite well for domestic dwellings, they do not work for classrooms. The quite necessary absence of large, frequently-tended fireplaces in schools, means that the walls have started to crumble as there’s no heat or smoke to dry and the preserve the clay. The Plateau’s heavy rains have quickly degraded the corrugated tin roof. As a result, the classrooms are cold, muddy and often wet places. Especially when the Plateau’s heavy rains come during wet seasons. The untreated and thin corrugated metal roofing sheets rusted through long ago. Space is also an issue. There simply isn’t enough room for the school’s 165 students in its four small classrooms. Though unstable, the bamboo benches do give some students a place to sit, the difficulty they face is that they have no desks to support their books when they’re writing. An absence of desks forces children into writing into books perched on their laps. The rocks are used as benches when the classroom has become too full. Bibangwa’s new school will be constructed from durable materials; solid brick walls with deep foundations, galvanized (rust resistant) metal roofing sheets, cement floors. It will be designed to last, and to protect children from the cold and the rain. Desks and benches in the school’s six classrooms will give every child a place to sit. They’ll no longer have to stoop over books perched on their laps. Windows will allow natural light to illuminate the classrooms. Children will be able to learn without distraction from uncomfortable, dark surroundings. Thick, galvanized metal roofing sheets and guttering will keep rain out of the classrooms. Benches and desks, made by local carpenters, will let the children sit and write in comfort. Glazed windows will keep the elements out, but allow daylight into the classrooms. Partnership will be the driving force behind the construction of Bibangwa’s new school; between Children in Crisis, The Virdee Foundation, EMI (our local Congolese partners), and the parents of Bibangwa. The contributions made by Bibangwa community will be particularly important. Bibangwa is one of the remotest places in which we have undertaken school construction, we won’t be able to do it without significant help. Trucks will have to offload any building materials at the end of one of the few dirt roads that serve the area. One of the many contributions from the community will be to carry these materials, including metal roofing materials, by hand or head on a three-hour walk up steep slopes to Bibangwa. EMI, our Congolese partners, have already started working with Bibangwa’s parents, preparing for the start of the construction work. Stones are being gathered for the school’s foundations. The structures you can see in the photo below are bamboo cages. Each cage contains the foundation stones collected by one family – as you can see, there are plenty of families involved and women are very much doing the heavy work. Foundations stones are currently being gathered by community members. Each bamboo basket represents a different family’s contribution. Women gathering foundation stones (more like rocks!). The contract, in which EMI, Children in Crisis and Bibangwa community agree to our responsibilities in the construction of the new school has also been signed. Here, the Head of the committee of women which is helping with the construction of the new school, is putting her signature on the document. We hope to see the new Virdee school opening in April 2017. We’ll have to wait for camera memory cards to get down from the Plateau (and then for photos to be sent via very slow internet from EMI’s offices in Uvira), but we’ll post updates on the construction as often as we can! Prof. Peter was delighted to co-host a dinner in support of Namal College, Pakistan, at the eponymous Nobu London in Old Park Lane on Saturday night. Prof. Peter and fellow hosts, Mohammed Amersi, Amit Bhatia and Syed Bukhari were joined by Imran Khan, former Capitan of the Pakistan Cricket Team, and the Chairman and founder of Namal College, for an evening of wonderful food and delightful company. The select list of just 50 guests raised £150,000 in less than 3 hours, a fantastic achievement that will help the college continue offering financial assistance to undergraduates from rural and less privileged backgrounds. Mr Imran Khan established Namal College in 2008 when he was awarded the Chancellorship of the University of Bradford, with the aim to make quality higher education available and affordable for the marginalised rural youth in the region. Namal College is an associate college of the University of Bradford and now has 300 students studying for a University of Bradford degree for a fraction of what it would cost to study at the University in the UK. Ninety percent of Namal College students are provided with full or partial scholarships. Prof. Peter and friends thoroughly enjoyed Adele’s concert at London’s O2 Arena in style; with a great view, comfortable seats plus champagne and snacks served in the private box Prof. Peter had arranged for the evening. Adele’s performance was described as ‘outstanding’ and ‘pure class’ with the set incorporating tracks from her most recent album, 25, the Oscar-winning Bond theme, Skyfall, as well as tracks from her first two albums. Her amazing vocal abilities kept the audience in awe, while her ‘banter’ provided a lighter note to balance the emotional journey on which her lyrics took the 20,000-strong crowd. A fabulous evening, in terrific company, both on and off the stage. Prof. Peter joined the Government of Antigua and Barbuda for the official inauguration of the 3 MWp solar power plant at V.C Bird International Airport of Antigua. The solar plant was built and installed by PV Energy Ltd, Peter’s clean energy company, as the first part of a contract with the Government of the twin island state to develop and install 10 MWp of solar power which includes a 4 MWp solar power plant in another area of Antigua, a 1MWp solar power plant on Barbuda and a total of 2MWp rooftop installations on more than 50 Antigua schools and public buildings. The solar power plant at V.C. Bird Airport has been fully operational since 5th December 2015 and took just 87 days to be developed and constructed from bare ground. The 10 MWp contract with PV Energy is vital step for Government of Antigua and Barbuda in achieving their stated target of 20% of electricity from renewable energy and thus reducing the use of fossil fuels. The ceremony was attended by more than 450 guests from over 25 countries and included the Governor General, His Excellency Sir Rodney Williams, GCMG, KGN, KStJ, GCFO, MBBS (UWI), and representatives from the governments of St. Lucia, St. Kitts & Nevis and Montserrat. The audience were addressed by Peter, as Chairman of PV Energy, the Honourable Gaston Browne (Prime Minister and Minister of Finance and Corporate Governance), the Honourable Asot Michael (Minister of Tourism, Economic Development, Investment & Energy), the Honourable Robin Yearwood (Minister of Public Utilities, Civil Aviation and Transportation). Prof. Peter stated ” The use of renewable energy sources shows the commitment of Antigua and Barbuda to defend and promote the values of sustainable development, to protect and respect the environment and to preserve it for future generations. We are proud to support the Prime Minister’s supreme vision of creating a greener environment. With this pioneering project Antigua and Barbuda will set an example for the whole of the region.